A Bombay cat makes a knockout first impression. Concealed in inky black fur, with a set of sparkly gemstone eyes, she is a visual stunner you will not soon forget. The exquisite and always black Bombay cat (there is no such thing as a white Bombay cat!) was deliberately bred by Nikki Horner of Louisville, Kentucky, to resemble a jungle panther. Horner hit a bulls-eye score on that point, as the Bombay cat definitely conjures up a mirage-like image of the noble and stealthy panther. In fact, the Bombay fur is exceptionally dark, right down to the roots. 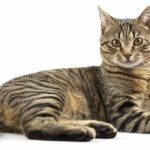 Would you like to enjoy the company of a social, intelligent cat that combines traits of both the American Shorthair and Burmese breeds? If so you’re in luck, because the brilliant Bombay is bred from both of these felines! In just a bit we’re going to delve into Bombay cat facts such as the Bombay cat meow, Bombay cat temperament, and Bombay cat size. We’ll also discuss the Bombay cat kitten, Bombay cat behavior, and the Bombay cat cost. But first, let’s begin by taking a closer look at the origins of this striking and sensational cat. The late Nikki Horner began her quest to develop a panther-like domestic cat in the 1950’s. She scored a success in 1965, and five short years later the Bombay cat breed, named after the Indian city, was recognized and registered by the Cat Fanciers’ Association. In 1979 the Bombay was recognized by The International Cat Association too. Horner set out to create the American Bombay by crossing sable Burmese cats with black American Shorthairs. 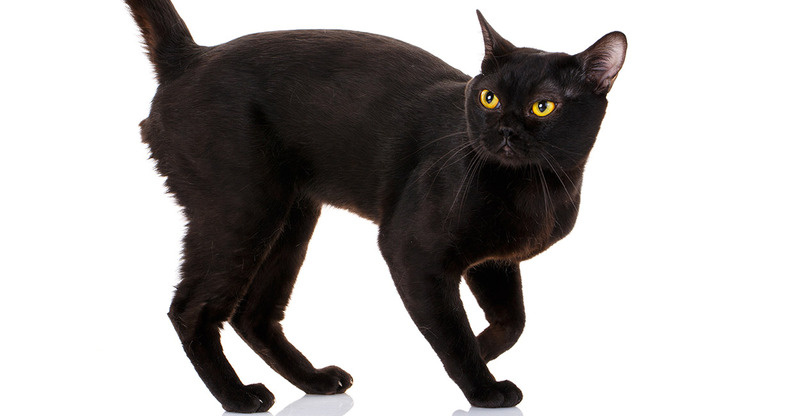 A British Bombay cat also exists: these cats are very similar in looks and personality, with the U.K. cat recognized as the result of a cross between Burmese and black domestic cats. It’s believed that ancient Burmese cats were worshipped in Burma (now Myanmar). Modern Burmese are descended from a Burmese and a Siamese cat, which makes their allure all the more exotic and mysterious! Burmese are playful, people-oriented and exploratory cats with a delightfully throaty voice. The Siamese is a wonderfully vocal animal as well, and both breeds are highly intelligent. The American Shorthair is a pedigreed cat who was originally brought to America by European settlers. The shorthair had one job on board: keep the rodents away from the food! Today these independent-minded moggies enjoy a more relaxed domestic life and make wonderful animal companions. 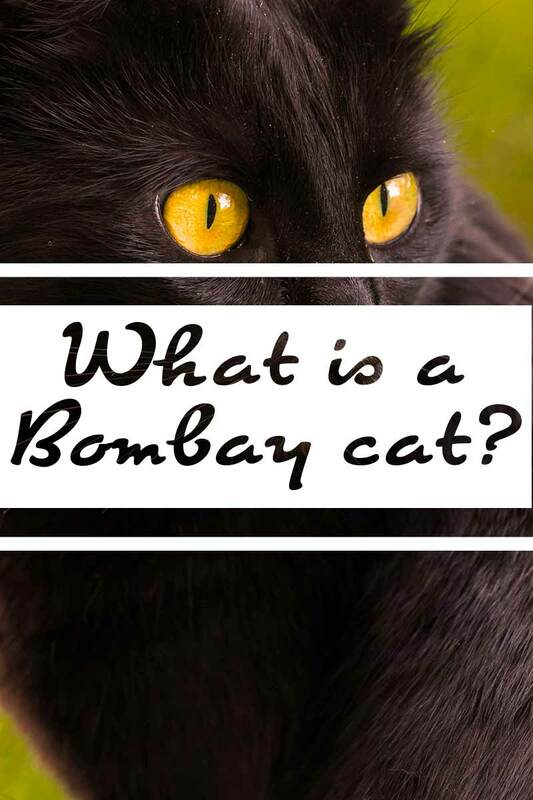 What does a Bombay cat look like? Bombay moggies are always short haired cats. And did I mention that Bombay cats are always black?! In addition to its black coat, this delightfully distinctive feline possesses a black nose and black toes! Perfectly complimenting it’s dark, glossy appearance, Bombay cats have either shiny copper or sparkling green eyes. What we can say is that the Bombay has a low shedding, low maintenance coat which many people find reduces their allergic response. But in addition to fur, dander and saliva also provoke an allergic response. So it’s really impossible to tell how any one individual’s immune system will respond until the moment of truth arrives and you come face to face with a Bombay cat. Are you wondering about the Bombay cat weight? You can relax, one thing they don’t have in common with wild panthers is their size! Ranging from approximately 6 to 12 pounds, the Bombay is a medium sized, muscular cat. One of the reasons behind the Bombay cat’s arresting looks is the fact that the hair remains black, even down to the roots, with very little fading to a lighter hue. In addition the feline boasts a short, fine, body-hugging coat that is ultra-glossy and full of sheen. 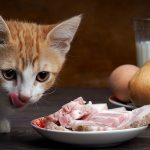 A complete and balanced diet is an important key to keeping your moggie’s magnificent coat in tip-top shape, as well as ensuring that she stays happy and healthy. What do Bombay cats eat? Cats are obligate carnivores meaning that their diets should consist mainly of high quality protein. A cat’s digestive system is inefficient at extracting nutrients from plants, making meat its primary source of sustenance. Your Bombay feline should always be fed a complete and balanced diet, one with the proper ratio of nutrients for its age. Commercial cat food that meets this criteria carries a verifying statement on its label. The Association of American Feed Control Officials (AAFCO) is the body that certifies both cat and dog food in the U.S.
It’s loving, sociable personality is one reason that the Bombay cat is considered to be a good choice for families. These shadowy moggies like and want attention, a trait that children of all ages will adore. Unlike some of its more independent feline brethren, the Bombay cat does not care for long periods of alone time, and often will choose a special human to attach themselves to. This is a cat who wants to an active part of his human’s world and doesn’t mind being a lap-sitter. 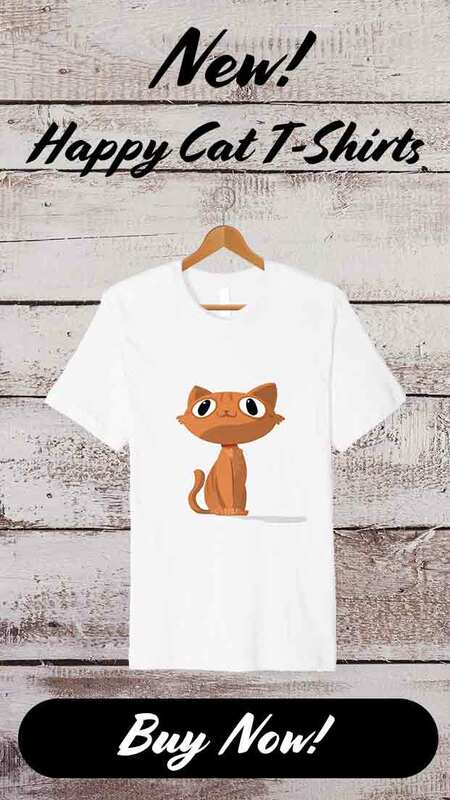 For this reason Bombay owners should be available to spend quality time with their fur baby, as the Bombay is emotionally suited to having companionship. In addition, Bombay cats are described as getting along well with other animals, a definite perk for households with multiple pets. Although the Bombay is content to be your mini-me, he still needs some activity and exercise as well as play time on his own. Cat climbers and condos, plenty of toys, a scratcher and a bed are kitty-cat necessities and will give your little one an outlet to exercise his imagination and muscles. Of all their superlative qualities, the deep purr of a Bombay cat is just another that stands out from the crowd. The Bombay cat purr has been described as unique, which is not a surprise given his lineage. Both the Siamese and Burmese cats are legendary talkers, with their own unique sounds, so it’s not surprising that the Bombay has inherited a bit of their vocalization situation! There’s no denying that beautiful Bombay cats are conversation pieces. Likewise, they themselves like to communicate through talking and crying and meowing. Just be aware, that if your cat chooses to tell you about her day, it may be in the middle of the night! The Bombay cat breed does not have an overly detailed record when it comes to health problems and medical issues. It is a relatively healthy cat, but in terms of health, its relationship to the Burmese bears greater scrutiny. For one thing, Burmese are bred to have a characteristic flat face, something that can work against it in the long run. The flattened bone structure can result in cranial deformities, sinus issues, runny eyes, loud breathing, etc. Hopefully such dangerously exaggerated features will never become as sought after in the Bombay cat. In addition the Bombay may be predisposed to glaucoma via genetic inheritance. In fact, Burmese, Siamese and Persian breeds are all predisposed to vision disorders. Diabetes is another potential issue to be aware of when caring for a beautiful Bombay kitty. How long do Bombay cats live? Most healthy Bombay felines can be expected to enjoy a lifespan between 12 to 16 years. Your cat’s emotional, mental and physical well-being depends in large part on you. All loving pet parents want the best for their animals. Tangible behaviors such as providing enough food for our pets are easy to quantify. But our pets depend on us for love and comfort as much as they do for food and water. In particular, a highly social and people-oriented cat like the Bombay has a high need for affiliation, and a lack of quality time with his human or family will not serve him well. 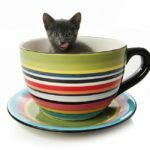 Many animal welfare experts believe that some feline health problems can be correlated with behavioral issues. 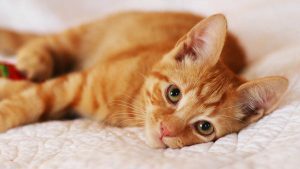 For example, researchers have studied the link between feline lower urinary tract disease and impaired emotional affect such as generalized anxiety. 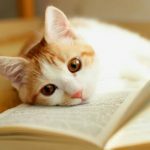 In layman’s terms, your pet’s quality of life, including her lifespan, is impacted by the interactions that you share, as well as by her environment and DNA. Always work with a responsible breeder when you consider a pedigreed cat. When you meet with a breeder, ask to see health records for the cats that you are interested in, and if possible to meet the parents. Your breeder should be happy for your to meet your future kitten with their mother, and mum should clearly be a much-loved family pet. Although Bombay cats do not have a lengthy list of health issues, it is important to see that its medical needs such as vaccinations, etc., have been provided for. Because of their scarcity, it is not likely that you will find a Bombay cat at a shelter, but you may be able to locate one at a specialized organization or through a rescue group. Ready for a kitten with beauty and brains? Yes, the Bombay cat has both in abundant supply! Bombay kitties are described as fast learners and thus easily trained. On top of that, they are said to have a few more manners than the average boisterous, rambunctious kitten. In the looks department the baby Bombay is born with either blue, green or brown eyes. But their peepers will turn to either the classic copper or vivid green at about the 1-year mark. Other than their eye color, baby Bombays resemble the adult Bombay from the outset. How much is a Bombay cat? The Bombay cat is a relatively rare animal, and their price tag reflects this. For example, at the end of the last century the Cat Fancier’s Association had fewer than 100 registered Bombay cats. Likewise, the Bombay breed is not overly represented at cat shows. But what it lacks in numbers it more than compensates for in appeal and attention-getting double takes. An online search of Bombay cat breeders revealed that the average price of a Bombay cat ranges anywhere from approximately $400 to $700 and sometimes higher. Show cats will command higher prices, with a price tag of $2,000 not unheard of. And don’t be surprised to find yourself on a waiting list if you do pursue ownership of a Bombay. Is a Bombay cat right for me? 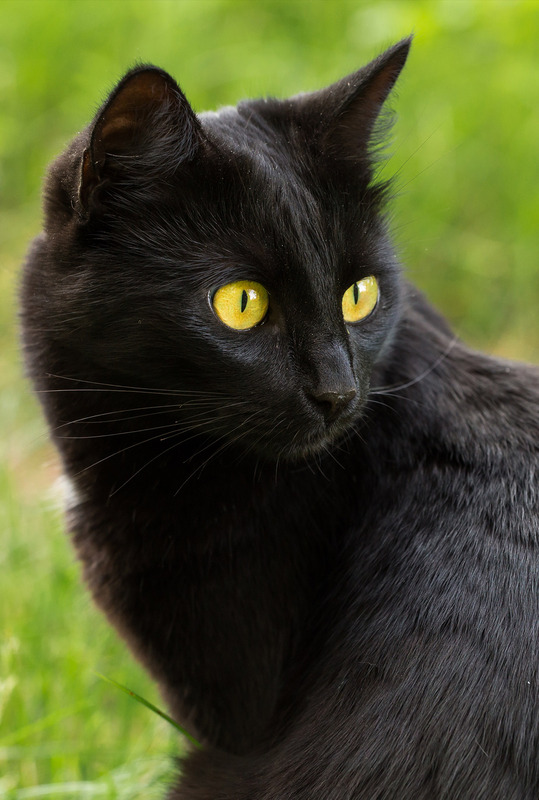 If you want a cat who wants to be an active, affectionate part of your life, one who is smart and beautiful to boot, a Bombay cat may be in your future! This inky black, solidly built and muscular cat was bred to resemble a panther, and on that score he earns an A+. But she also has a pleasant personality and a social need to be a part of the goings-on within your life and house. Bombay cats should be able to spend time with their loved ones, and keeping them alone for long periods will feel like a punishment to these sensitive creatures. Because of their Burmese genes, Bombay cats may be at risk for diabetes, craniofacial issues, and glaucoma. But as you can see, overall Bombay cat traits do not leave a lot to be desired. These magnificent cats are not only highly unique and beautiful to look at, they are intelligent, loving, and demonstrative companion animals as well. Are you in love with a black Bombay cat? How did you find each other, and what advice would you give someone else looking for a Bombay kitten? I don’t know she’s a Bombay. But the looks and personality match what you say above. I don’t see how she could be since she came to our door at around 6 weeks. Either she was let go, or she was born as a feral. She had blue eyes then, now yellow. Every part of her is black, even including her whiskers. She matches every important detail in your article. How would I find out if she is a Bombay?